This web page is provided as a resource to mineral collectors. Contact the property owner before entering the property to obtain written permission to collect minerals. John Betts does not own this property and he cannot grant permission to enter the site. Presently there is no quarrying being done in the area. Dumps have been excavated at the Howe No. 1 quarry for use as crushed stone. All of the quarries discussed in this article, except the Hollister and Simpson, are located in the Colton Hill Formation, formerly called the Bolton Schist. This formation is bounded on the east by the Glastonbury granite gneiss and on the west by mafic gneiss. The Colton Hill Formation, a coarse-grained metasedimentary formation with complex folding, outcrops in a narrow band extending from Portland through Bolton. It is largely made up of biotite schist, and is sparingly interlayered with micaceous quartzite and amphibole gneiss. Along the eastern border of the Colton Hill Formation is a schistose facies of the Glastonbury granite gneiss (average grain size of 1 mm), indistinguishable from the Colton Hill Formation except for the presence of euhedral epidote (Rice and Foye, 1927; Altamura, 1987). It is in this formation that the Simpson and Hollister quarries are located. Pegmatites are recognizable in the local topography as small hills, due to the relative hardness and resistance to weathering of the pegmatites in relation to the country rock. These pegmatites form sill-shaped bodies following the foliation of the surrounding schist, and are commonly exposed on the western sides of the hills. The origin of the pegmatites has not been determined. The age of the nearby Hale, Andrews, and Spinelli pegmatites were determined to range in age from 260 to 300 million years old. Cameron et al. (1954) concluded that they are linked to the Glastonbury granite gneiss (that they called Monson gneiss). Stugard (1958) disagreed, observing that the age of Monson gneiss is 370 million years and the younger pegmatites could not be of the same origin. Instead, he proposed that the pegmatites formed later from a magma-like fluid, by a process of fractional crystallization. Most of the area pegmatites are predominantly composed of perthite, quartz, plagioclase, and muscovite. Schooner (1961) reported 114 minerals in his reference on the area mineralogy. Beryl and tourmaline are widespread accessory minerals, but account for less than 1 percent by volume. The random distribution of beryl-bearing pegmatites led Stugard (1958) to conclude that beryl was common in all of the area pegmatites, but was not reported because of insufficient visible exposure. The area surrounding the quarries is suburban development of private homes. Collectors are encouraged to stay clear of these developments to prevent antagonizing adjacent land owners. Access to most of the quarries is via the pipeline right-of-way. Collectors should park at location A (fig. 2) at the intersection of Dayton Road and the pipeline. Then proceed southwest on the trail along the pipeline. 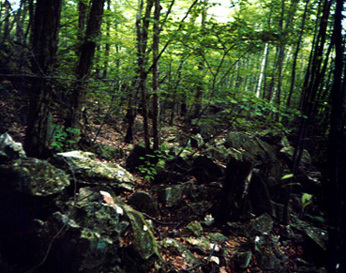 Figure 3 - Overgrown quarry dumps at the Husband quarry, S59. There are two cuts in the exposed pegmatite, one on the side nearest the pipeline and another on the far side of the hill. 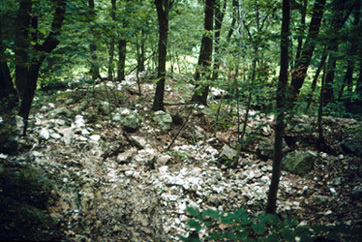 Much of the dump rock visible nearest to the pipeline appears to be from pipeline excavations rather than from pegmatite mining. There have been reports of good quality bismutite, molybdenite (fig. 4) and torbernite from these locations (Schooner 1996, pers. comm.). 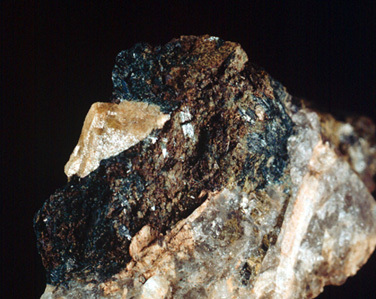 Also, the excavations for the pipeline produced a well-known, one-time find, of three inch-long euhedral epidote crystals associated with titanite and scapolite, in a cross-cutting quartz vein (figs. 5 and 6). 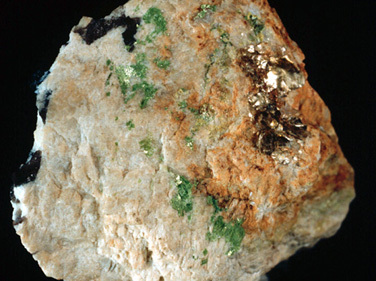 Figure 4 - Green Torbernite on albite with muscovite from the Husband quarry (S59). Collected in 1920 by Professor Rice, Wesleyan University. Wesleyan University Natural History Museum Collection No. 5115. 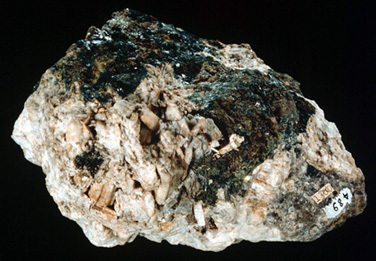 Figure 5 - Specimen of scapolite and epidote crystals 7 inches across from the pipeline excavation. Wesleyan University Natural History Museum Collection No. 489. Figure 6 - Titanite crystal, half inch across, on epidote from the pipeline excavation. Wesleyan University Natural History Museum Collection No. 1248. 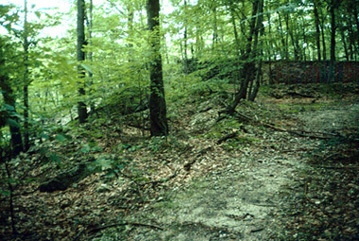 Further west along the trail, the next prospect encountered is on a small knoll to the right, location P1. This prospect was mapped as far back as 1958, but very little excavation work is evident compared to the surrounding quarries (Fig. 7). The P1 prospect is at the south end of a large pegmatite that continues north-northeast and intersects Dayton Road. Beryl crystals, up to 4 inches in diameter, are visible at several places in the wall rock (Fig. 8). Recent field collecting has yielded sharp, pale blue-green beryl crystals in albite matrix (Fig. 9). Because of the proximity to the trail and how little it has been exploited, this prospect is one of the more promising locations in the district for mineral collecting. Figure 7 - View looking back towards pipeline clearing of small prospect diggings at P1. 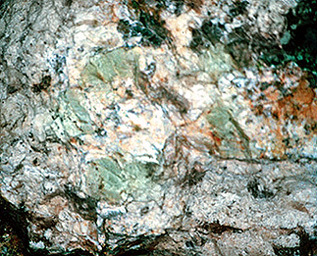 Figure 8 - Large light green beryl crystals to 4 inches diameter visible in the quarry wall at P1. As the pipeline trail begins a sharp descent, another trail intersects the pipeline running north-south. North along this trail there are four large quarries in a single pegmatite, which extends north-northeast for 100 yards. 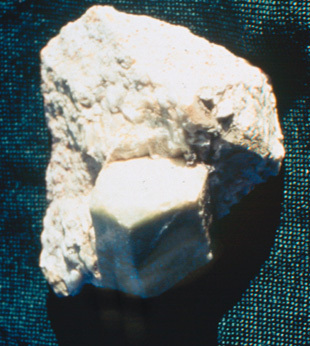 This pegmatite was designated by Stugard (1958) as number 50. He also identified one of these quarries as the Howe No. 4, but it is uncertain which one. The northernmost quarry pit is closest to the site Stugard (1958) designated as number 50 on his map, so that number has been used for the north quarry, S50. The other quarries (from south to north) are assigned numbers P2, P3 and P4. Figure 9 - Green beryl crystal one inch across in albite matrix collected in 1996 at the P1 prospect by Ken Colosky. Photo by K. Colosky. Figure 10 - Stone wall retaining mine dumps between locations P2 and P3. Dumps continue downhill for 100 feet. The size of the quarrying operations here were quite extensive. Two of the quarries, P2 and P3, exceed an estimated 20,000 tons of excavated rock each. The quarries are visible east of the trail and large dumps can be seen to the west and downhill for over 100 feet. Ninety yards north of the pipeline a large stone retaining wall is visible (fig. 10). It separates the dumps quarries P2 and P3. Very little collecting has been done here. However the amount of material exposed on the dumps downhill suggest further exploration by field collectors. South of the pipeline, along the same north-south intersecting trail, a long cut has been made at P5. It extends from the trail north-northeast for 160 feet almost intersecting the pipeline clearing. The dumps are visible to the right of the trail. Little collecting has been done at this location in recent times. This locality information is for reference purposes only. You should never attempt to visit any mineral localities listed on this site without written permission of the land owner and/or mineral rights owner and that you follow all safety precautions necessary to protect yourself and the property. Unfortunately, the status of mineral collecting sites change often. Inclusion in this site does not give an individual the right to trespass. ALWAYS ASK PERMISSION prior to entering a collecting location. ALWAYS RESPECT THE PROPERTY OWNER, you are his guest. Never enter a property posted no trespassing. When in doubt, do not enter the property.